From Intimate to Exclusive, our first-rate banquet & meeting facilities, award winning cuisine and unparalleled service will transform your event to extraordinary! 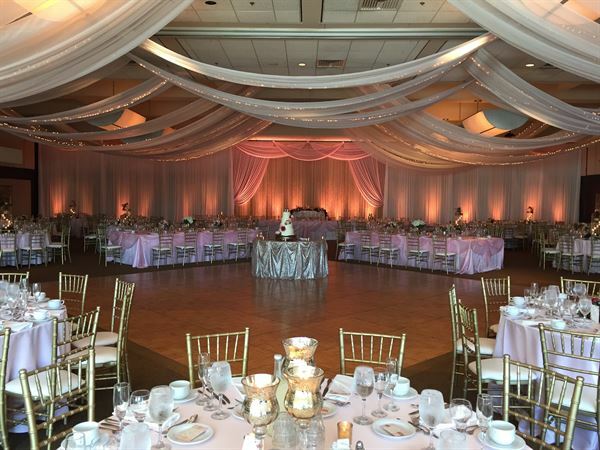 We have 35,000 square feet of banquet and meeting facilities. We offer an exceptional learning environment coupled with comfort and superior services, for events of 25 to 1200 guests. The dramatic 24-foot-height ceilings of the rooms with amber lighting are designed to be acoustically superior and feature soundproof walls, with on-site audiovisual amenities. Whether you are looking to plan a wedding reception, corporate function or birthday party, our expert Event Specialists will work closely with you to ensure that your day is an event to remember. Fabulous venue with large and small space for weddings, corporate and all other large and small events. Special promotional rates for Winter Season Events. Outdoor Terrace space available for outdoor ceremonies, along with interior space for ceremonies. Large venue for large corporate events. Large venue for multi-culture events with event planning. The staff went out of their way to make our event a success. The food is not just good...it is phenomenal! Usually food at events such as this and for this size (400) is only ok but this was food people truly enjoyed! Everything was delicious, including the desserts. I would highly recommend this venue! I was in a bind to find multiple large rooms for 3 consecutive days in October with only 3 weeks notice. I happened upon Bobak's website so thought I would try. Julie answered my e-mail within minutes. From there it has been a wonderful relationship. Bobak's bent over backwards for our every need. The food is prepared on site and I received rave reviews from all attendees. Will definitely use Bobak's again going forward.